Enjoy a warm and hearty breakfast without regretting your decision later with this Paleo pancakes in several different styles. Depending on if you want sweet and fluffy, or thick and hearty, we’ve got you covered with plenty of pancake recipes that fall within the Paleo eating guidelines. The main thing to kick out of your kitchen is all-purpose flour. Replace it with a combination of almond flour and coconut flour and you’ll be able to make all sorts of Paleo goodies that will keep you on track. 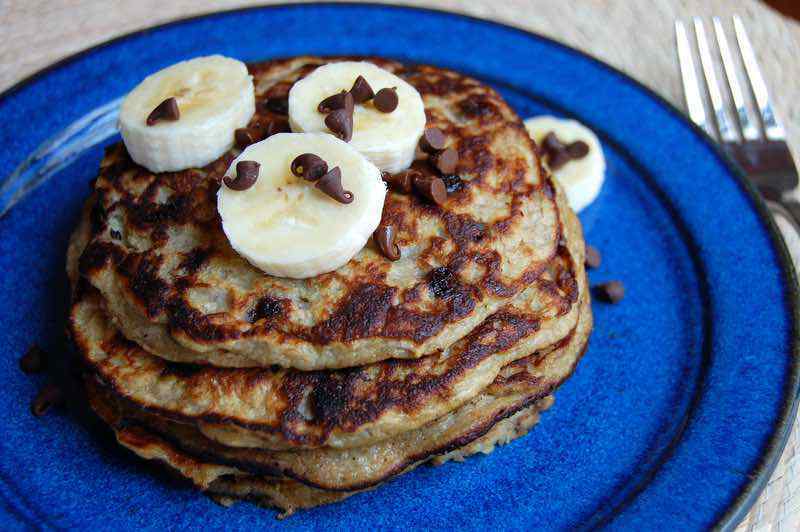 Fluffy banana paleo pancakes with chocolate chips are a great treat for Saturday mornings. 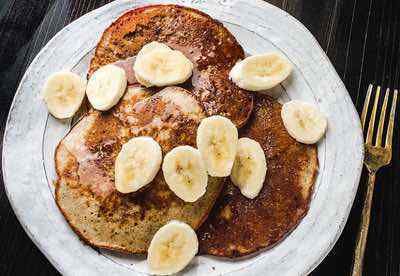 Overly ripe bananas are best used for these pancakes. Since the chocolate and bananas are sweet on their own, the pancakes need little to no syrup or honey drizzled over them. Or serve with fresh blueberries for a healthy breakfast. 1. In a large bowl, whisk together the almond flour, coconut flour, baking soda, and salt. In a separate bowl, blend together the eggs, almond milk, vanilla, honey, and banana with a hand blender. Add the dry ingredients into the wet and stir together until just combined. Let the batter sit for 3-4 minutes to allow the coconut flour to soak up the eggs. 2. Heat a griddle or non-stick skillet to medium heat. Coat the pan with coconut oil. Pour about 1/4 cup of batter onto the skillet, forming small pancakes so they are easier to flip. Sprinkle with a few chocolate chips. Cook for 2-4 minutes until the bottom is lightly browned, and then carefully flip. Cook for another 2-4 minutes until cooked through. Repeat with remaining batter. Serve warm. 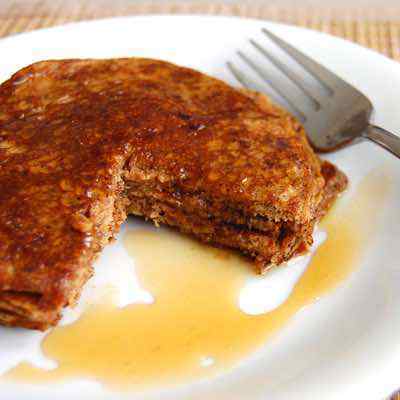 These paleo pancakes are bright and full of cinnamon flavor. It is best to cook these on a lower heat than normal pancakes – pay close attention when they are cooking so that the bottom does not burn. Use a very ripe pear for the best results. Top the pancakes with some walnuts and maple syrup for a satisfying weekend breakfast. 1. In a large bowl, whisk together the eggs, milk, honey, and coconut oil. Add in the grated pear. 2. In a separate bowl, whisk together the dry ingredients. Add the dry ingredients to the wet ingredients. Stir together until just combined. 3. Heat a griddle or non-stick skillet to low heat. Coat the skillet with coconut oil. Pour about 1/8 cup of batter onto the skillet. Cook for 3-5 minutes until the bottom is cooked through, and then flip. Cook for another 2-4 minutes until lightly browned. Repeat with remaining batter. Serve warm. It is completely normal and understandable to find yourself craving a favorite food often enjoyed as part of your pre-Paleo days. For many, finding high protein or satisfying breakfast choices can be a real challenge, and if you find yourself struggling with that same issue, perhaps you just haven’t found the right Paleo recipe to meet your needs. Since many traditional breakfast foods have grains as part of the ingredient list, Paleo followers can experience boredom and burnout if they are choosing to incorporate eggs and bacon as an easy go-to option for a high protein, satisfying choice. If you have an affection for flapjacks, but don’t want to stray from your Paleo lifestyle, no need to worry! So, why should you eat Paleo pancakes as part of your breakfast repertoire now and then? Let’s look at 4 good reasons why you should be eating these tasty treats as part of your day! 1. 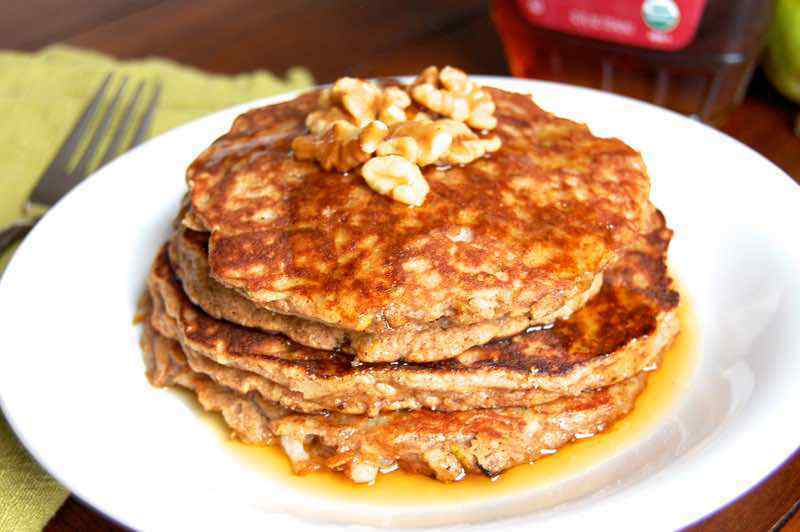 Paleo pancakes can satisfy your sweet or savory cravings. If you are craving something savory, there are plenty of Paleo pancake recipes that will provide the perfect solution to satisfying your taste buds. Savory vegetable pancakes are not only grain free and made of 100% real ingredients, but they also taste amazing and make incorporating vegetables much more fun. Take a look at these recipes that can be made for breakfast or brunch, or set aside some mix for an easy lunch or afternoon snack! And of course, if you are craving something sweet, much like the traditional pancakes you may be used to, Paleo pancakes can certainly help to address your sweet cravings! Just take a look at this awesome list of variations to try when the need for a sweet treat strikes! 2. Paleo pancakes are simple to prepare and require very few ingredients. 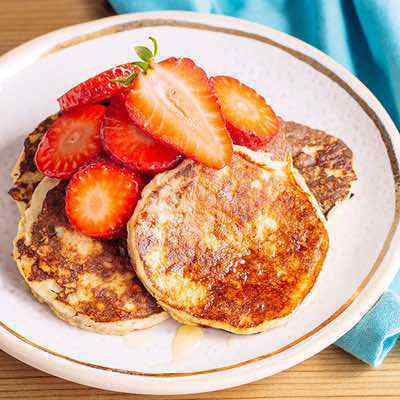 If you are running short on time in the morning, Paleo pancakes to the rescue! Many versions of Paleo pancakes require only 2 or 3 ingredients! If you are looking for ways to bulk up or customize your Paleo pancake recipe as a way to incorporate a variety of tastes and flavors, you can add in some almond butter for a more “pancake-y type” texture. The more almond butter you add, the more solid the pancake. You can also top your pancakes with warm grass-fed butter to enhance the flavor of the pancake, making it a rich and filling addition to your morning routine. 3. Paleo pancakes can be enjoyed by the whole family no matter their age. Eating eggs for breakfast day after day may be an easy way to cook up a high protein breakfast, but after a while, boredom sets in among children and adults alike. Perhaps you thought that your Sunday morning family breakfast would no longer be able to incorporate pancakes due to the typical ingredients such as while flour and sugar, but nothing could be farther from the truth. Fortunately, very talented Paleo chefs of all backgrounds have found several different ways to get around that ingredient roadblock. 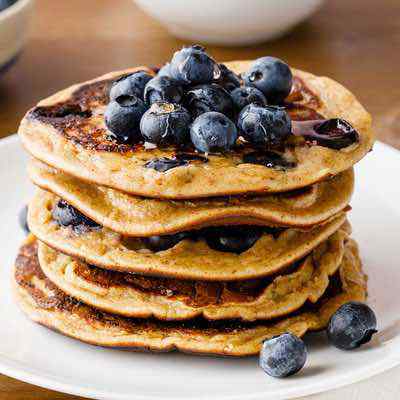 Take for example the addition of sweet potatoes to your pancake mix, providing your family with a host of antioxidants, vitamins, and minerals giving your body a morning burst of energy. With so many different variations of Paleo pancakes, you are sure to stumble upon one or more recipes that will become a family favorite! 4. Paleo pancakes provide your body with a warm, hearty, nutrient-dense breakfast. You can enjoy a warm and hearty breakfast without regretting your decision later when incorporating your favorite version of Paleo pancakes on any given day. 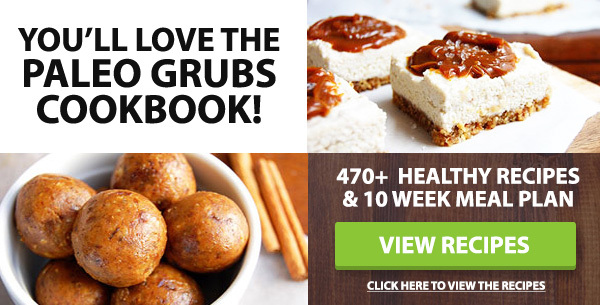 Sweet and fluffy, or thick and hearty, there are plenty of Paleo-friendly recipes that are super-charged with healthy, whole food ingredients such as nuts, eggs, and coconut oil. 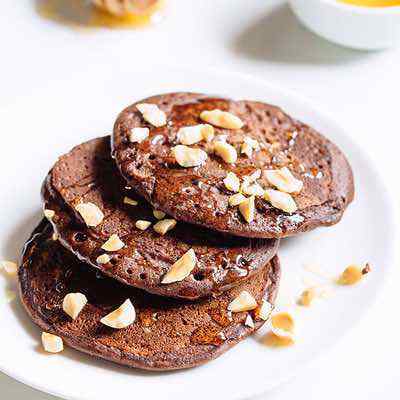 Take for example this warm and hearty version of Paleo pancakes, made from almond flour, which is rich in protein and provides your body with healthy fat to keep you feeling satisfied well after your breakfast meal ends. Add syrup to the mix, and you’ve just incorporated a hearty dose of sugar into your day, making it a recipe for disaster. 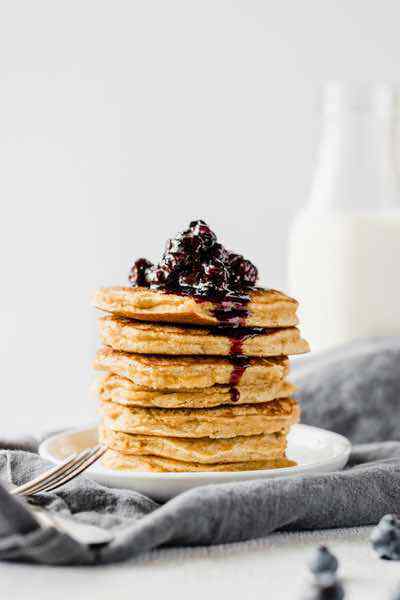 So now that you know that Paleo Pancakes are really good option for your breakfast meal, let’s review things to avoid as part of your Paleo pancake recipe. Simple sugars and artificial sweeteners: Both artificial and simple sugars have the potential to cause gut irritation, and most simple sugars can cause a spike in insulin, which later results in a blood sugar crash. High fructose corn syrup consumption specifically can drastically decrease leptin sensitivity, your major hunger hormone, which results in an increase in appetite. (2) For more information on why most forms of sugar are not considered Paleo, you’ll want to give this reference a read! Dairy products: Milk specifically should be avoided as part of the Paleo diet. If you want a full explanation as to why it is best to avoid milk, you can read more about it on Dr. Loren Cordain’s website. (3) To sum it up, milk contains an astonishing number of hormones, and bioactive peptides, which likely breech the gut barrier. Once that occurs the immune system is activated and normal physiological function can no longer occur. For example, the insulin cows produce has been linked to increasing the risk for type 1 diabetes in young children. In addition, the estrogens found in cow;s milk can increase the risk for breast and ovarian cancers in women and prostate and testicular cancers in men. Whole-grain flour containing wheat and gluten: Most “wheat” products containing gluten are nothing more than similar versions of refined, white flour that have been treated with some sort of coloring agent giving it the guise of being a healthier choice. To read more about the additional concerns related to the consumption of gluten, be sure to check out this link explaining why it can be problematic to your overall health. Take Home Message: From sweet to savory, simple to put together or a more complex ingredient list, Paleo pancakes are a great addition to your day as a way to nourish your body with a nutrient-dense meal full of protein and healthy fats. If you are trying to teach your children the importance of proper introduce from a very early age, what better way to introduce them to the Paleo diet than through a delicious breakfast addition. There are plenty of recipes to choose from listed as part of this resource, and numerous others you can find on the internet through a simple search to keep your pancake repertoire interesting, too. Keep in mind, when you start to experiment with Paleo pancake recipes be sure to remember that gluten-free flours are often heavier than regular flour, so your grain-free pancakes may be a bit on the denser side. Don’t forget, these pancakes can also be prepared ahead of time and refrigerated for a snack later in the day or a meal later in the day! So, now the decision is up to you. Which recipe are you going to try first? 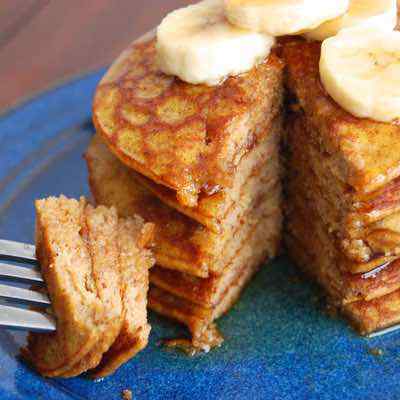 Adding pumpkin to pancakes is a great way to flavor them up without adding anything that will slow you down or make you fat. 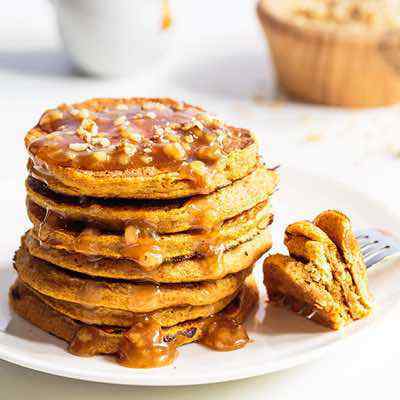 These pancakes are also flavor enhanced with bacon, and have a bit of crunch thanks to the pecans so you’re getting a mouthful of savory bacon, nuttiness from the pecans, and the distinctive taste of pumpkin in each bite. Because they use coconut flour these come out light and fluffy, and taste great. If you didn’t know it was a Paleo recipe you might not even realize it as you’re eating them. Using coconut flour instead of all purpose flour is one way to turn ordinary pancakes into paleo friendly pancakes. This recipe shows you the basics when it comes to substituting flours to make the pancakes better for you. 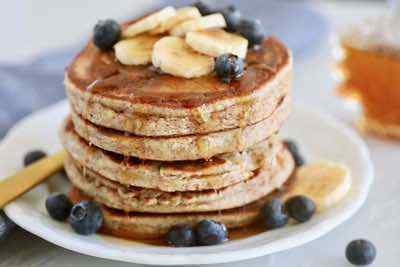 These come out looking and tasting just like the pancakes you remember before starting paleo, and the list of ingredients includes things like coconut oil, raw honey, coconut milk, and coconut flour, so as you can see they are really relying on coconuts to put this together. Since coconut doesn’t contain any grains or dairy, it’s a perfectly suitable food for Paleo, including all of its byproducts. Here they’re using a combination of almond flour and coconut flour to get the right texture. 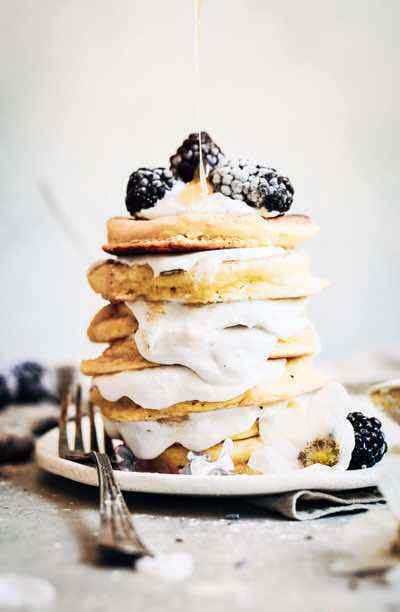 Coconut flour produces light and airy pancakes, while almond flour makes them a little more dense and thick, so using both makes for a happy medium. Using nutmeg, cardamom, and cloves is a surefire way to get your taste buds going first thing in the morning, and the flavor of these will surely stick with you through the morning and into lunch. They get their sweetness from molasses, and their buttery flavor from ghee. With the right garnishment these look pretty enough to grace a magazine cover. These pancakes harness the flavor of apple pie, and serve them up in a format that is easier to make first thing in the morning. These are covered and smothered in apples, as well as a nice serving of maple syrup, so she’s doing a good job of combining two food types into one mega-delicious creation. Stack these as high as you can for the best presentation, but remember to only eat until you feel full, as part of the Paleo way is listening to your body and it’s natural senses it has in place to tell you when it’s hungry and when it’s not. 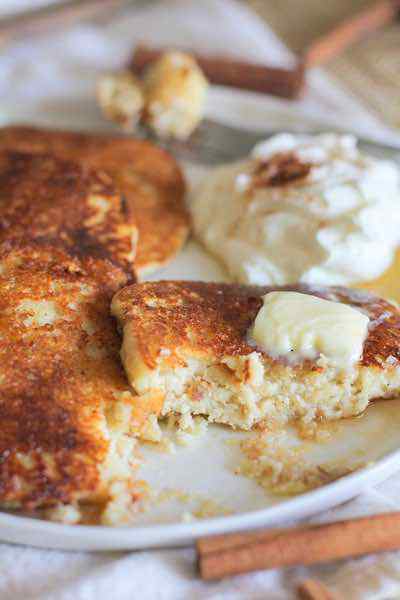 These pancakes combine two popular tastes, coconuts and bananas, into one pancake, and top the whole thing off with a lemon-infused butter. The coconut flavoring comes from coconut oil as well as real coconut that is mixed right into the batter. The banana of course comes from a banana, and the lemon butter uses ghee and lemon zest and juice for it’s flavor. This is an interesting mix of ingredients, and most likely not something you’ve tried in the world of pancakes. Paleo is all about broadening your palate and trying new things. Carrot cake lovers will want to take note of this pancake concoction. It is meant to taste like carrot cake, complete with a cream cheese frosting, without using any grains or dairy. The carrot flavor comes from – surprise! – carrots, and the way they made the cream cheese frosting without using any cream or cheese is pretty awesome. They borrowed a page from the vegan cookbook and used cashews to create the right texture. From there it was just a matter of getting the taste right using only Paleo ingredients. Success! Top it with some crushed pecans and eat it up. 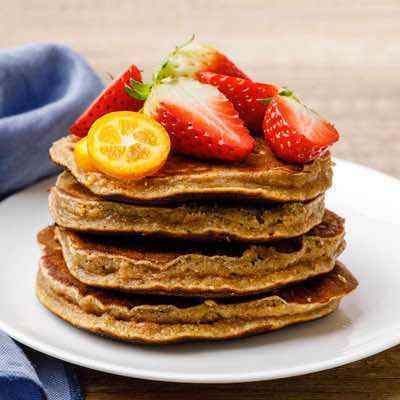 These protein pancakes are made with plenty of eggs and nuts to provide you with a wholesome source of protein, and without weighing you down with unnecessary ingredients. In fact, there are only 4 ingredients used, so you can make these up whenever you want a hot breakfast that will keep you satiated until the lunch whistle blows. Eggs, almond flour, and coconut oil are the main ingredients, add a bit of water and your batter is all set for the griddle. Embrace simple recipes like these because Paleo involves cutting out all of the stuff you shouldn’t be eating, and only using the minimum number of ingredients to make food delicious. 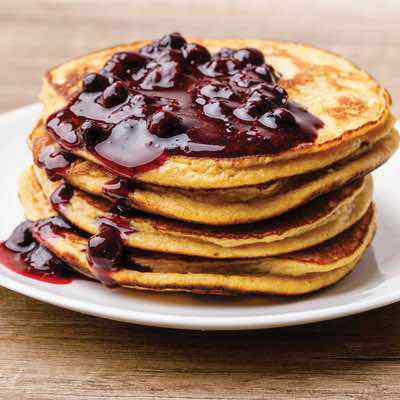 Pile on the deliciousness with these pancakes that use a heaping portion of strong coffee to make sure that you not only get full, but get wired in as well. The coffee is used not only in the pancakes themselves, but also in the syrup, so you’ll be getting a double dose of caffeine to start your day without merely sitting and drinking a cup of coffee. The coffee goes really well with the chocolate, making this a treat to have when you need a wake up call, or any time you want your caffeine fix. This is the pancake recipe to make when you don’t have a lot of ingredients on hand because it only uses two of them. Some pancake recipes say “just add water” which technically is two ingredients, the mix and the water, but this one is much more natural. 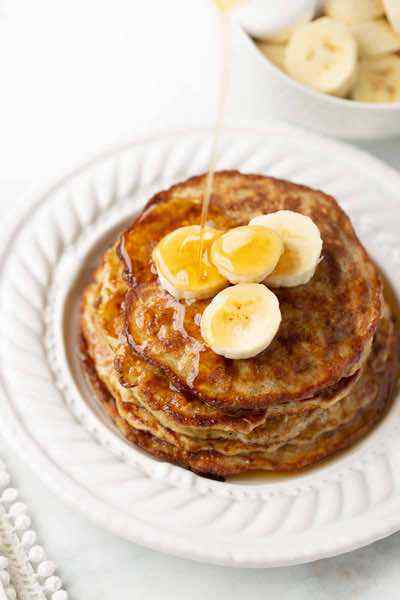 It uses a banana and some eggs to make the batter, so these will definitely taste like banana pancakes. You can add to it if you want, consider dark chocolate chips as a great source of antioxidants, and third ingredient that can really make these special. We were skeptical at first, but give this a try and you’ll be a believer. Macadamia nuts are one of the featured nuts on the Paleo diet, so you don’t have to worry about eating them, or whether they’re good for you or not. The healthy fats they contain are something that the Paleo plan encourages, so you can indulge in them without feeling guilty. Here they’re using a coconut butter that already has the macadamia nuts in it, so you don’t have to buy them separately and wonder how to prepare them. This is a recipe that is purely Paleo, so no adjustments or substitutions need to be made, just make and enjoy. Serving breakfast to morning company? This is a recipe that is sure to please, even if they’re not following Paleo. Everyone can enjoy this, and it makes such a nice presentation that they won’t even think it’s diet food of any sort. That’s a great thing about Paleo, you don’t have to eat food that others think is weird or odd or is obviously diet food because it’s just natural food that tastes good. These pancakes are smothered in chocolate and served up with fresh, tart raspberries so you get antioxidants galore without having to plug your nose while you swallow it. There are chocolate chip pancakes, and there are banana pancakes, and each tastes great on their own. When you put the two together you’re onto something really great, and that’s what we have here. They have made sure to use unsweetened chocolate chips, and then used palm sugar to keep things Paleo and not introduce any refined sugar. The ordinary white sugar that comes in those big bags at the store has been processed so much it’s a crime to call it sugar or even food. Get back to basics by using unrefined sugars in all of your Paleo cooking. Almond butter is sure to become your new best friend on Paleo. That’s because peanuts are a no-go, and almond butter makes a great substitution. Here they’re not substituting it for peanut butter, they’re just using it to make these pancakes taste great. Be sure to choose an organic almond butter to assure high quality. Coconut milk will make these come out light and fluffy and creamy, and there’s just a bit of cinnamon to help it all taste just right. You simply can’t go wrong with these if you’re a fan of nuts and bananas. These pancakes only use a little bit of apple cider, but the distinctive taste of cider really rings through. 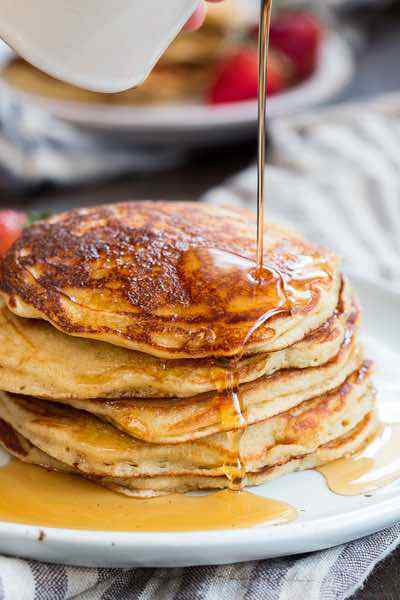 You won’t have any concern over grains or wheat because it’s using almond flour as the base, and it gives these pancakes a nice thickness to them without taking away too much from their fluffiness. The end result is a pancake that you can cook up any time you happen to have some apple cider handy, and they’re even so good you might want to seek it out just to make these. There are so many ways to gussy up a pancake, but coffee has got to be one of the more logical choices out there. 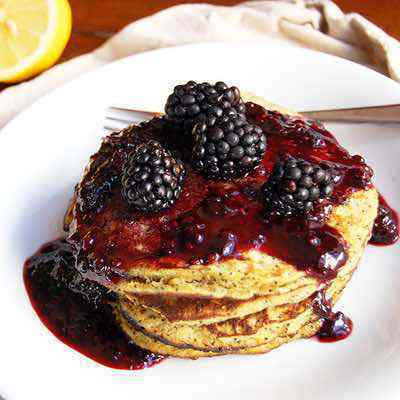 It’s a morning staple for many, and here you’ll be using instant coffee granules mixed right into the pancake batter. You can opt for decaf if you’re not doing caffeine, and you can also just take the coffee out if you just want some delicious chocolate pancakes. No matter how you play this you’re going to get a great deal of flavor to start your day off the right way. Next articleCan scientists learn to remove bad memories?